Do you know the saying, “It’s funny because it’s true”? Well…that is not what I was going for when I came up with this particular comic. I was aiming for absurdity. Twenty years ago, this was a ridiculous proposition. Times have, indeed, changed. In Michigan, at least, you can’t even smoke in a bar anymore. 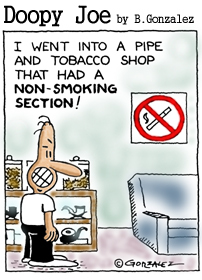 Now, I don’t know for sure if smoking is not allowed in a pipe and tobacco shop…but I would not be surprised. Thus, the absurdity has faded like a puff of smoke. Previous Previous post: Check, please. Next Next post: I think, therefore, I think I am.